Nigerian Biography: Biography of Lanre Lasisi, Producer, Presenter, Channels Television. Biography of Lanre Lasisi, Producer, Presenter, Channels Television. 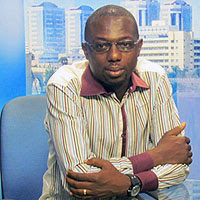 Lanre Lasisi is the producer and presenter of Channels Television. his first degree and masters degree., with special focus on development communication. Lanre Lasisi anchors ‘The Gavel”, a programme that reviews the weekly activities of the Nigerian parliament and analyses its impact on the Nigerian polity. He is our parliamentary reporter, covering the activities in the House of Representatives, an institution he has covered for over eight years. He has attended various international and national workshops.